Since 1956, the organization of growers has operated at corner of Sixth and Brannan streets. Over 100 vendors operate in a block of buildings, owned and run by flower growers. A coalition of flower vendors, florists, tenants, wholesalers and concerned citizens are gathering to lambaste the scheduled purchase by Los Angeles developer, Kilroy and Company that provides no tangible guarantees for locally owned businesses occupying the space. If you agree that Kilroy Realty Corporation should not evict long-term tenants at America’s 2nd largest Flower Mart, please sign below! A Petition from the Campaign to:­­­ Tell Kilroy Realty Corporation not to evict long term tenants at America’s 2nd largest Flower Mart. The coalition of flower vendors, florists, tenants, wholesalers and concerned citizens gathered to lambaste the scheduled purchase by Los Angeles developer, Kilroy and Company that provides no tangible guarantees for locally owned businesses occupying the space. For 102 years, these hardworking vendors, suppliers, and growers work to give you the best quality of flowers while at the same preserving the pulse and heart of the flower industry in San Francisco and Northern California. Now, again, it’s at risk. Flower mart tenants and supporters are calling for protections to save historic local business as the threat of eviction looms for lessees of the second largest flower market in the United States –with thousands of living wage jobs imperiled as NO guarantees have been given by LA based Kilroy Realty Corporation. 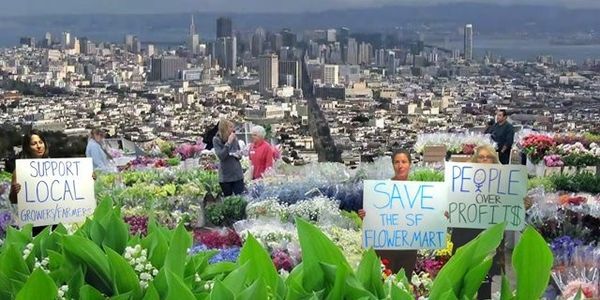 San Francisco is one of five flower marts left in the United States, and California growers alone are responsible for 19,000 jobs producing $2.4 million per day in salaries and wages, and $5.5 million per day is the total economic impact of business activity created by cut flower growers. Now, Kilroy Realty Corporation, a publicly traded company on the New York Stock Exchange, is on the eve of acquiring the property at the corner of Sixth and Brannan Streets to build a tech office campus. Kilroy is seeking to merge with or acquire outright the San Francisco Flower Growers Association for $26.6 million in stock and cash. The Flower Growers Association shareholders vote to approve the acquisition of this historic South of Market property is scheduled for September 11,2014. Long time tenants’ leases expire in less than130 days. Thus far Kilroy has refused to guarantee that they will not displace some 60 locally owned businesses, which in turn provide thousands of living wage jobs including growers, shippers, truck drivers, and provide flowers to our region’s 46,000 florists. Sign the petition to tell Kilroy that real, tangible agreements must be made to preserve the tenants – NOW, not after the ink is dry on a real estate deal.